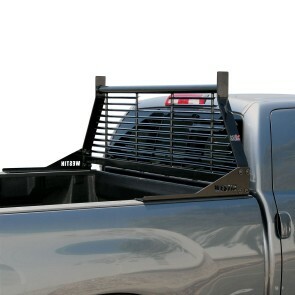 The HDX Commercial Grade Headache Rack protects your rear window from potential damage from shifting cargo. Welded tie-off hooks for securing your load are standard on all applications. Angled louvers keep sunlight out, the cab cool, and prevent UV damage to your interior all while allowing unobstructed visibility. 4 mount tabs give you the option of adding safety lights or accessories. Accommodates all major brand tool boxes. 2" diameter round top tube makes it easy to slide ladders & cargo. Includes complete mounting hardware for simple, bolt-on installation.